1. The smallest particles making up an atom are _____________. 2. The particle of matter having a positive charge is called a _____________. 3. The particle of matter having a negative charge is called a _____________. 4. What small particles unite to form molecules? 1. How do like charges act on each other? 2. How do unlike charges act on each other? 3. When electrons are removed from an object, the object has a _____________ charge. 4. Why are electrons and not protons removed by friction? 5. The force which causes electrons to flow is called _____________. 6. Static electricity is _____________ electrons. 7. Current electricity is _____________ electrons. 8. What does a condenser do with its electrical charge? 1. How does a current flow through a wire? 2. What is the electrical unit of quantity? 3. What is the unit of measure of current strength? 4. What two things control the strength of current? 5. Why are some substances good conductors? 6. Why are some substances good insulators? 7. If the potential of any given circuit is increased, the current is always _____________. 8. If "the resistance of any given circuit is increased, the current is always _____________. 9. What four things affect the resistance of a conductor? 1. Identify each symbol in the circuit diagram below. Refer to the table in figure 15 for your answers. 2. Why are dirty or loose connections classified as "opens"? 3. In making any type of connection, what is the most important thing to remember? 4. Why are fuses made of metals which melt at a low temperature? 5. What are some common causes of short circuits? 6. Why are no intentional grounds used on regular Navy ships? 1. What does emf mean? 2. What four kinds of energy can be converted into electrical energy? 3. What are the two most common sources of electrical power? 4. What is an ion? 5. Why can't primary cells be recharged? 6. What is the principal advantage of secondary cells? 1. 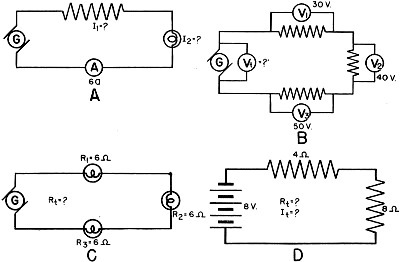 Solve for the unknown value in each of the circuits in the following drawing. flow if the resistance is increased to 60 ohms? lamp stand (a) 110 v. (b) 220 v.? 4. What two things control current in every circuit? 1. Does an empty lamp socket have force? 2. Is any work done by an open circuit? 3. Is any power consumed by an open circuit? the load in watts? In kilowatts? In hp? power is lost in this line? 8. What is the resistance of the line in problem 7? 9. If a line consumes 650 watts in transmitting 55 amperes, what is the potential drop? 10. How much power will be consumed by a 75 hp motor operating at 80 percent efficiency? In hp? In watts? In kilowatts? 1. Work out the answers for each unknown in the practice circuits in the following drawing. 3. What is the power consumed (a) in each unit, (b) in the total circuit of problem 2? 50 ohms resistance and 4 amperes of current? 30 ohm resistor if they are connected in parallel? the second draws 41 amperes. What is the total current? What is the total resistance? 6. What is the resistance of each device in problem 5? What is the total resistance? 2. How would you connect one switch to control two lamps? 1. All magnets have at least _____________ poles. 2. Describe two methods of producing an artificial magnet. 3. What two things does a vector show about a force? 4. What are the three important facts about a magnetic field? 5. Like magnetic poles _____________ each other. 6. Unlike magnetic poles _____________ each other. 7. Flux can choose either an air or an iron path. Which does it use? 8. Where does a compass point true north? 12. If you should break an ordinary magnet into 5 pieces, how many poles would you have? 14. Permanent magnets have a high _____________. 1. Is the direction of flux correctly labeled for the electromagnets in the following drawing? 2. Which of these coils is the strongest? A has 22 turns and 5 amperes. B has 37 turns and 3 amperes. C has 17 turns and 9 amperes. 3. How can you increase a coil's strength without changing the construction? 1. What two factors control the direction of an induced emf? 2. What three factors control the strength of an induced emf? 3. How many circuits are necessary for mutual induction? 4. How many circuits are necessary to produce self-induction? 5. Will steady d.c. produce a continuous self-induction? Why? 6. State Lenz's law in simple language. 7. How may the voltage of self-induction be dangerous around a motor? 8. In what one way does pulsating d.c. differ from regular d.c.? 9. In what two ways does a.c. differ from regular d.c.? 1. Name the two essential circuits of a generator. Briefly describe the parts of each. 2. When is the induced voltage of a coil zero? 3. When is the induced voltage of a rotating coil at its maximum value? 4. Is a.c. or d.c. produced inside a rotating coil? 5. How is d.c. obtained from a rotating coil ? 6. Adding coils to an armature does what to the. d.c. produced? 8. Why is a drum winding superior to a ring winding? 9. Distinguish between the stator and the rotor of an alternator. 10. Why are a-c machines designed opposite to d-c machines? 1. How does a d-c motor differ from a d-c generator in construction? 2. Motor action results from the reaction between two _____________. 3. What is motor action in a generator? 4. What is counter-emf in a motor? 5. What effect does counter-emf have on armature current? 6. What happens to the amount of counter-emf if the motor is slowed down? 7. What effect does decreased counter-emf have on the amount of current? 8. What is the principle function of a starter? 9. What are the two methods of reversing a motor? 10. What is standard Navy practice for reversing a motor? 1. What is the name of the only d-c motor which will run on a.c.? 2. What is the polarity of the secondary if the primary is north? 3. Do a-c coils have a fixed polarity? 4. What does "Polyphase" mean? 5. What are the units for measuring phase? 6. What is the meaning of "out-of-phase?" 7. Does any mechanical part of a stator move? 8. What does move in a rotating magnetic field? 9. Does the squirrel cage rotor have any electrical connection to a source of supply? 10. How does current get in the squirrel cage rotor? 11. The squirrel cage rotor is what kind of a circuit? 12. Does a wound rotor have an electrical connection to a source of supply? 13. How does current get in the wound rotor? 14. How is a synchronous rotor energized? 15. What is "magnetic lock?" 16. Name the three types of single phase motors. 17. What two methods are used to split single phase into two phases? 1. What are the two outstanding characteristics of a.c.? 2. An a.c. has a maximum value, of 25 amperes. What is its effective value? 3. How does resistance affect the phase of a current? 4. How does inductive reactance affect the phase of a current? 5. How does capacitive reactance affect the phase of a current? 6. How could you reduce the total reactance of an inductive circuit? and 8 ohms of resistance. (a) What is the total reactance? (b) What is the impedance? (c) Does the current lag or lead? 1. What four quantities are measured in an electrical circuit? 2. What are the three current effects used in meters? 3. Name the meters which can be used on a.c. or d.c.
4. Which meter can be used on d.c. only? 5. Properly connect the meters and loads shown above in their circuits. 1. In thermionic emission, why do electrons shoot off the metal surface? 2. Why is the air removed from a vacuum tube? 3. Why is the cathode negative regardless of battery connection? 4. Why does current never flow from plate to cathode? 5. How does a diode act as a rectifier? 6. How does the grid control current in a triode? 7. Why must the grid be biased negatively? 8. How does a triode amplify signals? 1. How is energy transferred from the primary to the secondary of a transformer? 2. Suppose d.c. were fed into the primary of a transformer, what would happen? 3. Explain how the secondary current controls the amount of primary current? has 800 turns. What is the primary current? used on the secondary, how many turns will be used on the primary? 8. Is it absolutely correct to say that transformers ate 100 percent efficient? 9. Two losses occur in a transformer? What are they? 10. How can the losses of a transformer be reduced? 1. How is power transferred in transformer action? 2. How many circuits will you find in transformer action? 3. What controls the power consumption in trans- former action? 4. Must the windings be stationary in order to have transformer action? 1. They repel each other. 2. They attract each other. 4. Because of their weight. Electrons are nearly 2,000 times lighter than protons. 5. Potential or potential difference. 8. A condenser stores an electrical charge. step-by-step, from molecule to molecule. 5. Good conductors have many free electrons. 6. Good insulators have few or no free electrons. 9. Diameter, length, material and temperature. 1. Refer to the table in figure 15. 2. Because they reduce current flow. 3. Do not increase the circuit resistance by a dirty or loose connection. 4. So that the fuse will melt and open the circuit before other parts of the circuit overheat. 5. Salt water, heat, wear, and vibration. 1. Electromotive force. The force which moves electrons. 2. Mechanical, chemical, frictional, and heat energies. 5. A part of the primary cell is used up in delivering current. 6. They can be recharged. 1. A - 4.4 amps. B - 108 v. C - 30 ohms. D - 20 v.
220 volts. This current would burn out the lamp. 1. Yes. There is an emf present. It tries to force current across the open circuit but cannot. 2. No, as long as no current flows it is a case of force but no motion. 3. No. Again, force but no motion. 4. 16,128 w. 16,128 kw. 2.16 hp. 5. 48,000 w. 37,300 w. 77.7 percent. 6. 27,602 w. 30,800 w. 89.6 percent. 10. 93.75 hp. 69,937.5 w. 69.94 w.
1. A = I1 = 6a., I2 = 6a. B:Vt = 120 v. C:Rt = 18 ohms. D:Rt = 12 ohms, It = 0.67 a. 2. 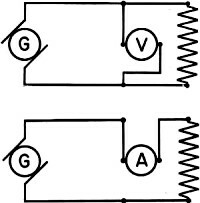 (a) 200 V., (b) 600 v.
3. (a) 2,000 w., (b) 6,000 w.
1. A:E1 = 12 V., E2 = 12 V., E3 = 12 v. B:It = 15a., C:Rt = 2 ohms. D:Rt = 2 ohms. 4. 66 amps. 3.33 ohms. 6. 240 ohms, 480 ohms, 176 ohms, 40 ohms, 24 ohms. 1. A: 150 ohms, 1.6 amps. B: E of lines = 30 volts, E of load = 90 v.
C: 60 v, 120 v. with R out of circuit. 2. Connect the switch in series with both lamps. 3. Connect the fuse in one line between the source and the first lamp. a current through the coil. 8. Anywhere on the Agonic line. 13. This iron is saturated-it is holding all the lines it can. 1. A: correct. B: incorrect. C: incorrect. D: correct. 2. C is the strongest. 3. Increase the coil's current. 1. Flux direction and the direction of cutting the flux. 2. 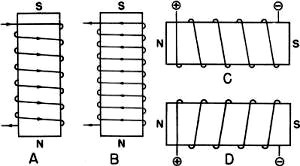 Strength of the field, speed of the conductors, and number of conductors cutting. 5. No. The flux field must move to produce self induction. 6. For every force, there is an opposite force set up which tends to cancel the first force. 7. 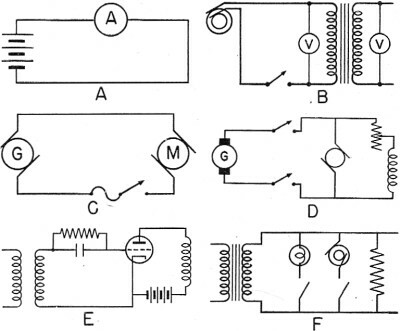 Open the field coil circuit may produce thousands of volts of self induction. 8. Pulsating d.c. varies in strength, regular d.c. does not. 9. A.c. varies in strength and direction, regular d.c. does not vary in either. 2. When the coil is in the neutral plane. 3. When the coil sides are directly under the pole pieces. 5. By rectifying the d.c. in a commutator. 6. More coils eliminate the peaks and valleys of current. Pulsations are reduced. 8. Less reluctance, cheaper, easier to repair, all coil sides cut flux. rotating part containing the field coils. 10. So that the high voltages obtained in a.c. will not be taken off on a shipping contact. 1. Not at all. Essentially the two are alike in construction. 3. The force set up by the two fields which tends to make the generator run as a motor. This is a Lenz's law illustration. 4. The induced voltage which opposes the applied voltage. Another Lenz's law illustration. 5. Counter-emf controls the current by opposing the current's flow. 8. A starter decreases current to the armature by putting a resistance in the armature circuit. 9. Reverse leads to either the field or armature. Not to both! 10. Reverse armature leads only. 3. No. A.C. coils reverse polarity with every re verse of current. 4. More than one time. 8. Only the flux field produced by the stator windings. the windings. Always a shirt circuit. 13. By induction-exactly like the squirrel cage. 14. With d.c. from an exciter, fed to the rotor via slip rings. 15. The field between rotor and stator poles of a synchronous motor. 16. Series-universal, repulsion-induction, and split phase. 17. Resistance and a condenser. 1. A.C. is constantly changing in value and regularly reverses its direction. 3. Resistance keeps the current "in phase." 4. Inductive reactance makes the current lag its voltage. 5. Capacitive reactance makes the current lead its voltage. 6. Add capacitive reactance by inserting a condenser. 7. (a) 6 ohms of reactance. (b) 1Q ohms of impedance. (c) The current leads. 1. Current, voltage, resistance, and power. 2. Heat, magnetism, and motor action. 3. Hot wire, dynamometer and movable iron. 1. The heat increases the electrons speed so that proton attraction can no longer hold them. 4. Because the plate has no electrons emitted to make up a current from plate to cathode. current can flow. Therefore, only the current in the cathode to plate direction is passed. controls the amount of current that can pass to the plate. grid ever becoming positive and losing control. would flow. The primary would burn out. adjusts primary current in exact proportions to the secondary current. 7. 1,760 and 440 turns. 9. Iron losses - hysteresis and eddy currents. Copper losses - resistance. length per turn, and using heavy wire. Both, by cooling entire assembly. 4. No, all that is necessary is two circuits with pulsating d.c. or a.c. on the primary. AGONIC: An imaginary line of the earth's surface passing through points where the magnetic declination is 0°, that is, points where the compass points true north. ALTERNATOR: An alternating current generator. AMMETER: The instrument for the measurement of current. AMPERE: The unit of electrical current. AMPERE-HOUR: The quantity of electricity equivalent to a current of one ampere flowing past a point in a conductor in one hour. AMPERE-TURN: The magnetizing force produced by a current of one ampere flowing through a coil of one turn. ANODE: The electrode in a cell (voltaic or electrolytic) that attracts the negative ions and repels the positive; the positive pole. ARC: The luminous glow between incandescent electrodes. ARMATURE: The movable part of a motor or the removable part of a magnetic circuit, such as the iron placed across the poles of a horseshoe magnet. AUTO-TRANSFORMER: A transformer in which the primary and secondary are connected together in one winding. BATTERY: A. group of several cells connected together as a unit. BRANCH CIRCUIT: One of the conductors in a parallel circuit. BRUSH: The conducting material, usually a block of carbon, bearing against the commutator or slip-rings through which the current flows in or out. CATHODE: The electrode in a cell (voltaic or primary) that attracts the positive ions and repels the negative ions; the negative pole. CHOKE COIL: A coil of low ohmic resistance and comparatively high impedance to alternating current. -CIRCUIT: The complete path of an electric current including, usually, the generating device. CIRCUIT BREAKER: A device that opens a circuit while it is carrying current; often used in abnormal conditions, such as overloads. CIRCULAR MIL: An area equal to that of a circle with a diameter of 0.001 inch. It is used for measuring the cross section of wires. COMMUTATOR: That part of the armature of a dynamo which converts an alternating into a direct current. CONDENSER: A device consisting of two or more conductors separated by non-conductor material; it holds or stores an electric charge. CONDUCTANCE: The reciprocal of electrical resistance. Conducting power. CONDUCTIVITY: The ease with which a substance transmits electricity. CONDUCTOR: A material capable of transmitting electric current. CONVERTER, ROTARY: An electrical machine having a commutator at one end and slip-rings at the other end of the armature. It is used for the conversion of alternating to direct current. CORE: A mass of iron placed inside a coil to increase its magnetism. COULOMB: The-unit of static electricity; the quantity of electricity transferred by one ampere in one second. COUNTER EMF: Counter electromotive force; an EMF induced in a coil or armature that opposes the applied voltage. CURRENT OF ELECTRICITY: The continuous flow of electrons in a circuit. D'ARSONVAL GALVANOMETER: A galvanometer in which a moving coil swings between the poles of a permanent horseshoe magnet. DEMAGNETIZE: To deprive a body of its magnetic properties. DIODE: A vacuum tube containing the filament and the plate; it serves as a rectifier of alternating current. DIP NEEDLE: A magnetized needle capable of rotation in a vertical plane. DIRECT CURRENT: An electric current that flows in one direction only. DYNAMO: A machine for converting mechanical energy into electrical energy or vice versa. EDDY CURRENT: A current induced in the core of an armature of a motor, dynamo, or transformer caused by changes in the magnetic field. EFFICIENCY: The ratio of a machine's useful work output to the total input. ELECTRODE: The terminal by which current leaves or enters an electrolytic cell. ELECTROLYTE: A substance that conducts a current by the movement of ions. ELECTROMAGNET: A magnet made by passing current through a coil of wire wound on a soft iron core. ELECTROMOTIVE FORCE (EMF): The electrical force that moves or tends to move electrons; ELECTRON: The smallest particle of negative electricity. ELECTROPLATING: The electrical method of plating a surface with a metal. ENERGY: The ability or capacity to do work. FIELD: The region where a magnet or electrical charge is capable of exerting its force. FIELD COIL: One of the coils used to excite a field magnet. FIELD MAGNET: The magnet used to produce a magnetic field (usually in motors or generators). FLUX: Magnetic lines of force, assumed to flow from the north pole to the south pole of a magnet. FREQUENCY: The number of cycles of an alternating current per second. FUSE: A part of a circuit made of a material that will melt and break the circuit when current is increased beyond a specific value. GALVANOMETER: An instrument used to measure small currents. GENERATOR: A machine that converts mechanical energy into electrical energy. GRID: A metal wire mesh placed between the cathode and plate. GRID BATTERY: The battery used to supply the desired potential to the grid. GRID LEAK: A very high resistance placed in parallel with the grid condenser. GROUND: A connection made directly to the earth or to a frame or structure which serves as one line of a circuit. HORSEPOWER: The English unit of power, equal to work done at the rate of 550 foot-pounds per second. Equal to 746 watts of electrical power. INDUCE: To produce an effect in a body by exposing it to the influence-of a magnetic force, an electric force, or a changing current. INDUCTION COIL: Two coils so arranged that an interrupted current in the first produces a voltage in the second. INTERRUPTER: A device for the automatic making and breaking of an electrical circuit. ION: An electrically charged atom. ISOGONIC LINE: An imaginary line drawn through points on the earth's surface where the magnetic deviation is equal. JOULE: A unit of energy or work. A joule of energy is liberated by one ampere flowing for one second through a resistance of one ohm. LAG: The number of degrees an alternating current lags behind voltage. LAMINATIONS: The thin sheets or discs making up an iron core. LEYDEN JAR: An early form of condenser. LINE OF FORCE: A line in a field of force that shows the direction of the force. LOAD: The energy delivered by a generator to its circuit. LODESTONE: A piece of magnetite. MAGNETIC CIRCUIT: The complete path followed by magnetic lines of force. MAGNETIC FLUX: The total number of lines of force issuing from a pole. MAGNETITE: An iron ore that is magnetic. MAGNETO: A generator in which the field is sup- plied by a permanent magnet. MIL: One thousandth of an inch. MILLIAMMETER: An ammeter reading thousandths of an ampere. MILLIVOLTMETER: A voltmeter reading thousandths of a volt. MOTOR-GENERATOR (M-G): A generator driven by an electric motor. MUTUAL INDUCTION: The inducing of an EMF in a circuit by the field of a nearby circuit. NEUTRON: A particle having the weight of a pro-ton but carrying no electric charge. NUCLEUS: The heavy or central part of an atom. OHMMETER: An instrument for directly measuring ohms. PERMALLOY: An alloy containing 78.5 percent nickel and 21.5 percent iron. It has an abnormally high magnetic permeability. PERMEABILITY: A property of matter that indicates the ease with which it is magnetized. PLATE CURRENT: The current that flows from the plate of a vacuum tube. POLARITY: The character of having magnetic poles, or electric charges. POLE: One of the ends of a magnet where most of its magnetism is concentrated. POTENTIAL: The amount of charge held by a body. POWER: The time rate of doing work. PROTON: A positively charged, particle whose charge is equal, but opposite, to that of the electron. RECTIFY: To change an alternating current to a unidirectional or direct current. RELAY: An electrically operated device for the closing and opening of a circuit. RELUCTANCE: A measure of the resistance of a material to magnetic lines of force. RESISTANCE: The opposition of a conductor to an electric current. RETENTIVITY: The property of retaining magnetism. SATURATION, MAGNETIC: The condition of a magnetic substance when its magnetism has reached its highest possible value. SELF INDUCTION: The process by which a circuit induces an EMF in itself by its own magnetic field. SERIES CONNECTION: An arrangement of cells, generators, condensers, or conductor each carries the entire current of the circuit. SOLENOID: A coil of wire used to produce a magnetic field. SPACE CHARGE: The charge acquired by the space inside a vacuum tube due to the presence of electrons. STEP-DOWN TRANSFORMER: A transformer with fewer turns in the secondary than in the primary. STEP-UP TRANSFORMER: A transformer with more turns in the secondary than in the primary. THERMOCOUPLE: A pair of metals which generate an EMF by the heating of one of the junctions; it is used to measure temperature differences. TRANSFORMER: A device that, without moving parts, transfers electrical energy from one circuit to another circuit by the aid of electromagnetic induction. TRIODE: A vacuum tube containing a filament, grid, and plate. UNIDIRECTIONAL: As applied to a current of electricity, a current that flows in one direction only. VACUUM TUBE: A tube from which the air has been pumped out. The tube contains an element that emits electrons when properly excited and an electrode to attract the electrons and set up a current in an external circuit. VOLT: The practical unit of electrical pressure. WATT: A unit of power produced by a current of one ampere at one volt. WATTMETER: An instrument for measuring electric power in watts. double conductor, 'lighting and power, armored. double conductor, lighting, braided. double conductor, radio, high -\ tension, leaded and armored. double conductor, radio, low - tension, leaded. triple conductor, lighting and power,ar¬mored .. triple conductor, radio, high - tension, leaded and armored. four conductor, lighting, braided. four conductor, lighting, armored._ general interior communication (multiple conductor), armored. bell wire. bell cord. vol tmeter leads, submarines. 148. MCMB multiple conductor, marker buo,! . GICF general interior communication conductor), flexible. TPTF twisted pair, telephone conductors, flexi- ble. HEAT AND FLAME RESISTANT SRI synthetic resin insulated, single conductor. SRIB synthetk resin .insulated, braided, single conductor. SRIG synthetic resin insulated, glass braided, single conductor. SHFW single heat and flame resistant wire, single conductor. DHFW double heat and flame resistant wire, dou- ble conductor. _ SHFS single heat and flame resistant, switch- board, single conductor. SFPS single conductor, flameproof, switchboard. SHFA single-conductor, heat and flame resistant, armored. SHFL single conductor, heat and flame resistant, leaded. DHFA double conductor, heat and flame resist¬ant, armored. THFA triple conductor, heat and flame resistant, armored. FHFA four conductor, heat and flame resistant, armored. MHFA multi-conductor, heat and flame resistant, armored. MHFF multi-conductor, heat and flame resistant, flexible. single conductor, degaussing, ar.-mored, 1,600,000 eM. SPECIAL WIRE AND' CABLE telephone switchboard wire. twisted pair, telephone, plain. twisted pair, telephone, armored. single conductor, lighting and power, ar-mored ..
triple conductor, lighting and power, ar-mored. SPECIAL WIRE, OIL RESISTANT DCOP double conductor, oil resisting, portable. TCOP / three conductor, oil resisting, portable. FCOP four conductor, oil resisting, portable. MCOS multi-conquctor,' oil resisting, shielded. The suffix number on' all power and light cables, such as SHFA,•DHFA, THFA, FHFA, SLPA, TLPA, SCP, DCP, TCP, and FCP, always indicates the number of thousands of circular mils in each conductor. The suffix number on all multiple conductor cables such as MHFA, MHFF, GICA, and GICF, indi¬cates the number of conductors in the cable.